Penn Points is proud to announce that some of its writers have won top state and national writing competitions this year. On the national level, Penn Points was tied with a another newspaper from a school in Kansas for the most national awards, with four a piece from the National Scholastic Press Association. One story, named in the top five feature stories by the NSPA, is still in the running for feature story of the year and overall national story of the year. This story, entitled “Life” has a different meaning for juveniles tried as adults, was written by Penn Manor grad Bryan Hess and senior Sarah Schaeffer. “It’s an honor to be nominated coming from a small school in Pennsylvania and be in the running against California schools with very strong school newspapers,” said Schaeffer. Penn Points received three other awards from the NSPA. Blake Wales and Jordann Stekervetz’s story titled A Permanent Remembrance Bears Painful Burden won an honorable mention in the Multimedia Package category. Morgan Fletcher’s story entitled Should the N-Word be given a green pass in school? received an honorable mention in the Diversity category. Faith Walauskas also received an Honorable Mention for an editorial cartoon. Penn Points’ authors were also rewarded for their talent in state-level competition. 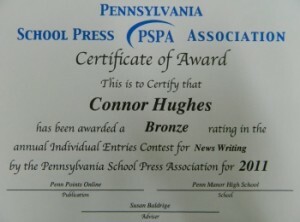 The Pennsylvania School Press Association awarded ten different authors for a combined total of sixteen awards. Here’s the list of PSPA awards……..
Sarah Garner – Gold in In-Depth Coverage, Bronze in News Analysis, Bronze in News Writing (2). Great to see that my top sports writers are award winning!